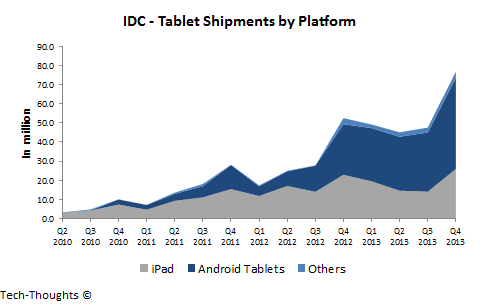 IDC's tablet market estimates for Q4 showed tablet shipments rising to 76.9 million units, just 7% below PC shipments in the quarter. 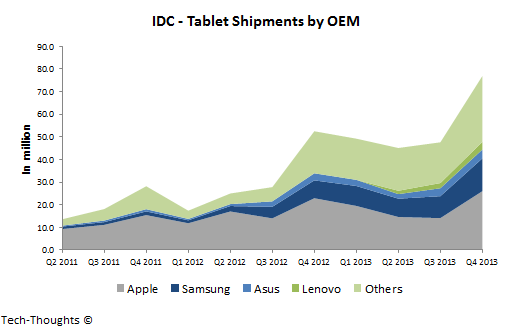 Android OEMs led the market with more than 47 million shipments, with the iPad at 26 million. Let's take a deeper look at these figures, split by OEM and category. It was interesting to note that the two OEMs with the lowest YoY growth were Amazon at -1.7% and Apple at 13.5%. While both saw a seasonal bump, their growth has been trailing the industry as mature markets reach saturation. In comparison, Samsung's shipments nearly doubled to 14.5 million units. Asus and Lenovo combined for more than 7 million units. Any growth from this point on is likely to be driven by emerging market demand. This also means that price competition is likely to intensify, with low-end/low-priced devices gaining an increasing chunk of volumes. This plays right into Lenovo's hands, as its strategy has been to flood emerging markets with an expansive, but low-priced product portfolio. With the acquisition of Motorola, Lenovo may make an upmarket move to high-end consumers in mature markets as well. In the chart above, Tier-1 Android vendors include just Samsung, Lenovo and Asus (Acer's figures were not reported by IDC), while Tier-2 & 3 include all other brands including Acer, Amazon, etc. along with white box vendors. 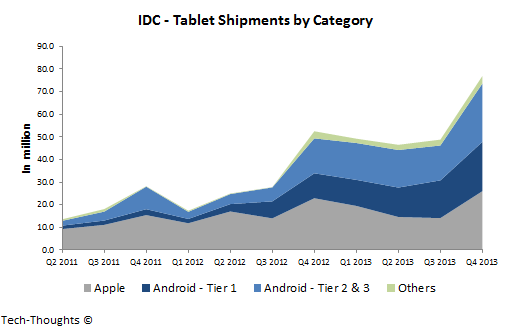 Tier-1 Android vendors overtook the iPad in shipments in Q3 but Apple retook the lead this quarter driven by the iPad Air/Retina iPad Mini launch. However, Tier-1 Android vendors have grown by ~100% YoY, compared to Apple's 13.5% growth. With Lenovo's likely rise, this should be the last quarter where Apple maintains a shipment lead over Tier-1 Android vendors.